The British writer J. G. Ballard is the author, in books such as Crash (now finding new audiences through David Cronenberg’s controversial film) and his most extreme work, The Atrocity Exhibition, of some of the most imaginative and disturbing experimental fiction of the post-war period. In the late 1950s, with only a few short stories to his name, Ballard conceived a ‘Project for a New Novel’ that can be seen with hindsight as a prescient instance not of ‘the designer as author’, but of the author as designer. Ballard’s proposal, in four double-page spreads, was to create a new kind of fiction that consisted of magazine-style headlines and layouts [a fifth later came to light]. 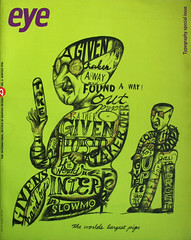 ‘The idea being,’ he later told the Californian publication Re/Search (no. 8/9, 1984), ‘that the imaginative content could be carried by the headlines and overall design, so making obsolete the need for a traditional text except for virtually decorative purposes.’ Ballard was working on a Chemical Society journal at the time and the headline lettering was clipped from the American publication Chemical & Engineering News; articles from the magazine were also used for the text. 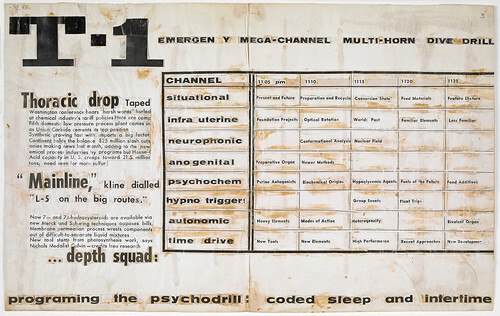 ‘Curiously enough,’ noted Ballard, ‘far from being meaningless, the science news stories somehow became fictionalised by the headings around them.’ These typographic collages were never printed, but Ballard did publish a series of ‘advertisements’ in the British literary magazine Ambit that are conceptually similar. 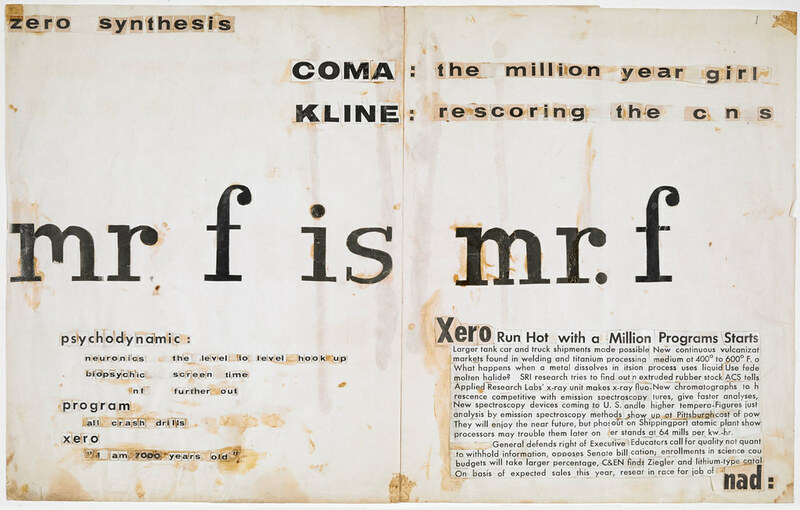 The three characters first glimpsed in these condensed and fragmentary fictions would later return: Mr F in the story ‘Mr F is Mr F’; Kline and Coma in The Atrocity Exhibition. Right and Top: Two of four text collages from J. G. Ballard’s ‘Project for a New Novel’.